Would like you to stock the Australian board game, QuestionTime, this Christmas? 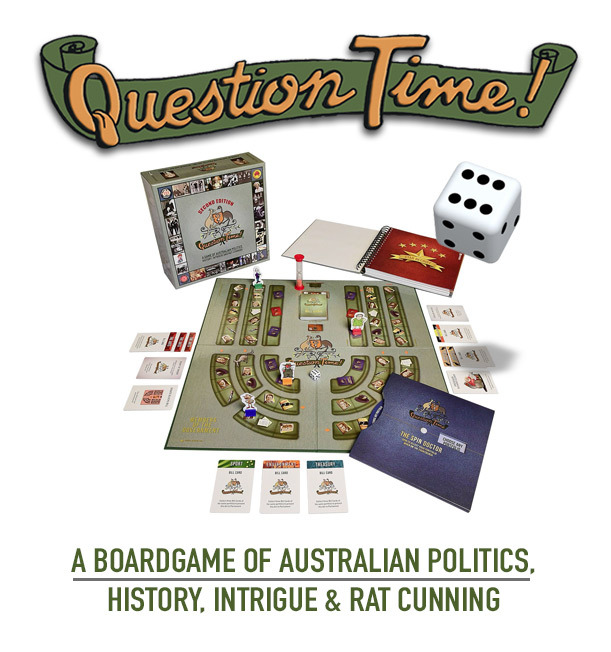 It’s a game about Australian politics and political history, with intrigue and rat-cunning thrown in. The board represents the layout of the House of Representatives and role-play is used to involve players in the ‘game’ of politics. It is great fun to play and educational as well. It has over 1500 questions – mostly multiple choice. Political knowledge is rewarded, but so are tactics, sneakiness and alliances. And there are a number of different wild cards that can be used to disrupt know-alls – by sending them to the back benches, blocking a proposed bill, and WORSE. This game has proved to be a popular Christmas present. One of our stockists sold over 500 copies in the 2 months leading up to Christmas. We designed the game in Australia for Australians. All components of the game are high quality – from the linen backed board – to the book of “Parliamentary Business and Questions Without Notice”. The games come in cartons of 4. Each game is individually boxed, which is handy if you need to send games out. RRP is $70, wholesale is $40. For more information visit our website questiontimegame.com.au or contact us by return email.